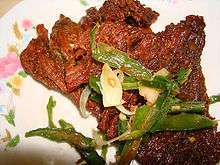 Dendeng refers to thinly sliced dried meat in Indonesian cuisine. It is preserved through a mixture of sugar and spices and dried through the frying process. It is similar to jerky. Dendeng was created by the Minangkabau people. At first they made Dendeng from beef, drying it so it could be eaten for days and bringing it with them when they traveled. The Minangkabau version — probably the most popular dendeng dish in Indonesia — is called Dendeng Balado or Dendeng Batokok is a speciality from Padang, West Sumatra, made from beef which is thinly cut then dried and fried before adding chillies and other ingredients. The most common Dendeng in Indonesia is Dendeng Sapi (Beef Dendeng), and it usually tastes sweet through the addition of coconut sugar caramelization. However exotic meat type is also available especially in Eastern Indonesia. Dendeng Rusa (Deer Dendeng) can be found in Nusa Tenggara islands and Papua. Indonesian Chinese usually favour pork dendeng called Bakkwa.